Somewhere between Tadao Ando and a whole lot of contemporary modernism, concrete has cemented itself as one of those genre defining aesthetics that have become the figurative ‘face’ of an entire design movement. Concrete as a material has a distinctly dark look that when applied to an interior setting can set the tone of the entire ambiance as moody or glum. But modernism thrives on everything stark and austere, and concrete application for such design aesthetics can turn out to be surprisingly moderate. From the dull shuttering of newly endorsed ceilings to the dark, pedestrian roughhewn textures of floor, concrete textures can be used in all manners of aesthetics. The most common application format of this specific material texture is tiling. 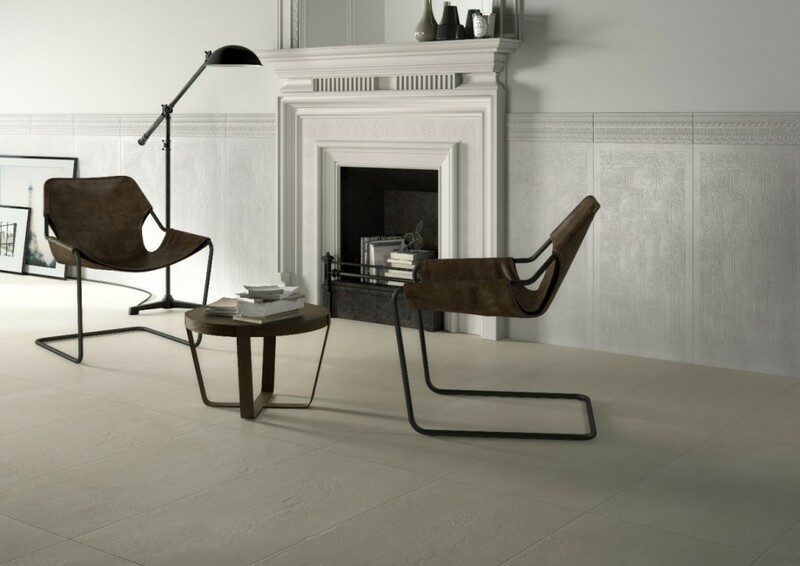 Concrete tiles has a classic appeal which stays true to the modern aesthetic. Its gloomy ambiance can be countered or neutralized by an introduction of ample natural light that might tip the scales in favor of it being elegant and sophisticated. The monochrome effect is quite exemplary if achieved in the concrete tiling specification. Today, we will be looking at a few tile designs inspired by concrete and critique on their overall outlook. This interior offers up quite a rustic aesthetic with its long beam structure and ceiling along with those kitschy windows. It is the floor, however, that sets the mood of this interior with its contrasting and juxtaposed visual effect and vibrancy. 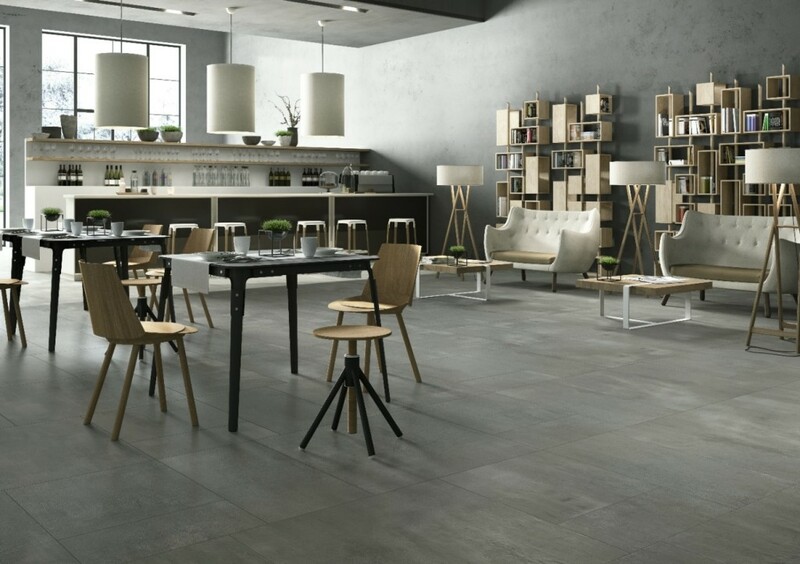 While most of this theme strives on the breezy side, the concrete floor tiles adds a natural positive gravitas that takes the tone in a completely different direction and offer up a grounded-ness that is very inherent of rich, dark tones. Most people uneducated in the art of aesthetics might consider gray a hue of doom and gloom, but in actuality it is a hue imbued with inherent class and elegance. 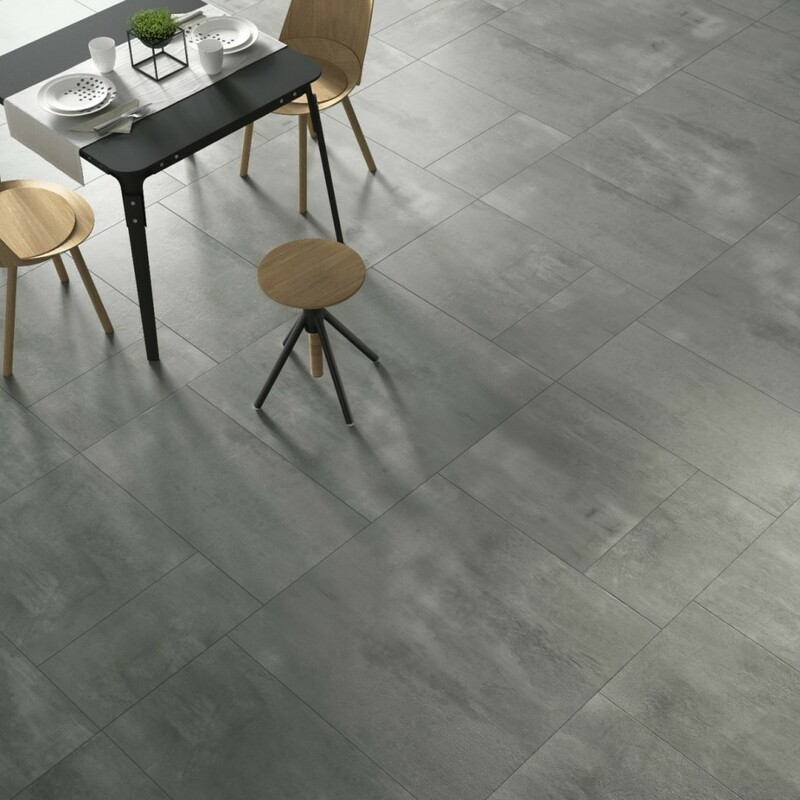 The image below shows a close shot of a concrete inspired tile floor that is neat and effortlessly unembellished at the same time. Concrete tiling can also be used to create an unpretentious yet sophisticated ambiance. 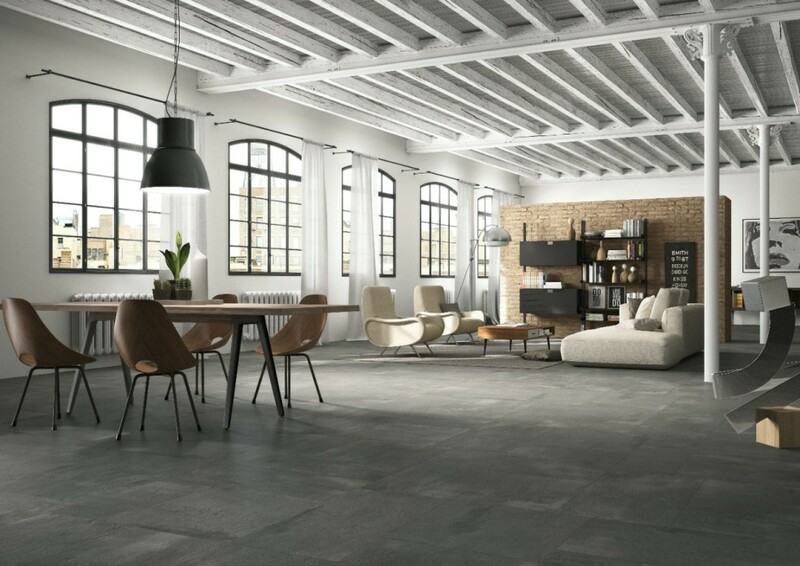 The combination of grey on walls and floors along with an abundance of natural light can create a tonal deference that is unique and tasteful at the same time. 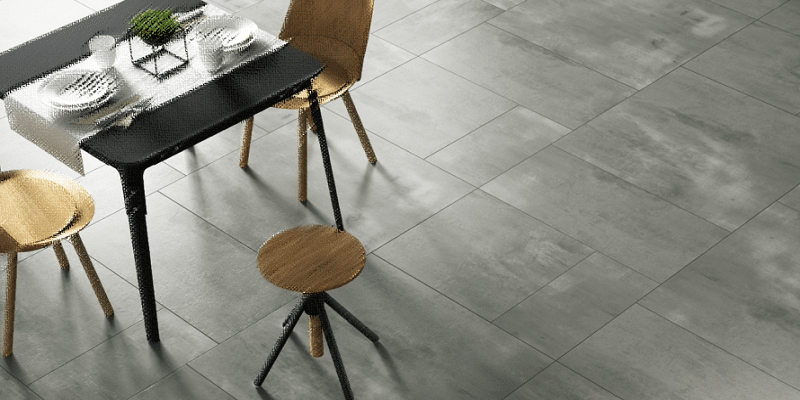 Concrete tiling comes in various flavors along with a number of textures, and this interior features a palate that is distinctly subtle compared to its previous dark counterparts. The restrained tonal ambiance is highlighted by subtle accents of natural light, and offer a lucid and unambiguous design. 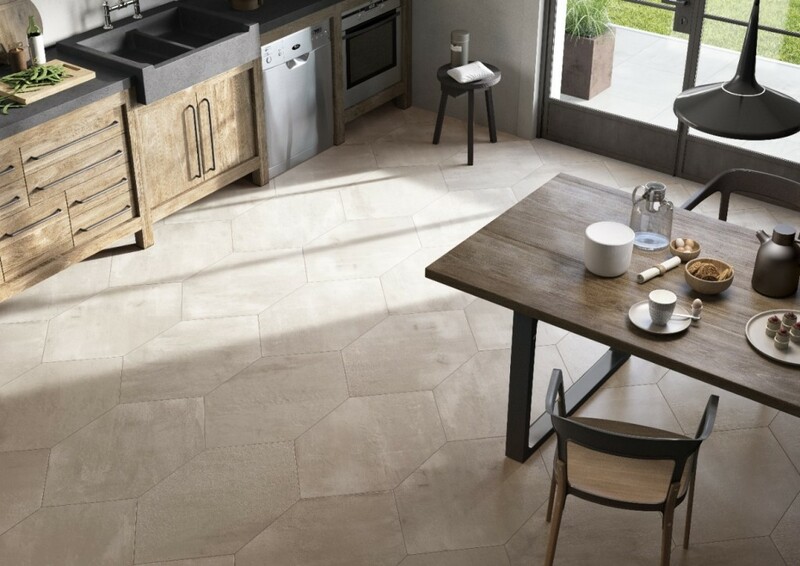 While squared up and ready to go might be the typical tile style, this distorted hexagon concrete finish matt tile offers up a stylistic opportunity to glam up your floors that is truly coherent with the contemporary mindset, which makes it an incredibly alluring design.